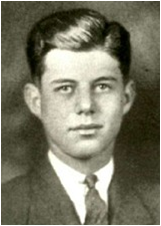 JFK on Nature and Nurture – Patrick F. Clarkin, Ph.D.
My university, UMass Boston, sits on a beautiful spot. Fortunately for us, we get to share a peninsula in Dorchester with the Massachusetts Archives and the John F. Kennedy Presidential Library. Taking advantage of our school’s location, I’ve made a few trips over to the JFK Library, a very attractive building designed by I.M. Pei. On one memorable visit, the revolving exhibit focused on Kennedy’s early years. 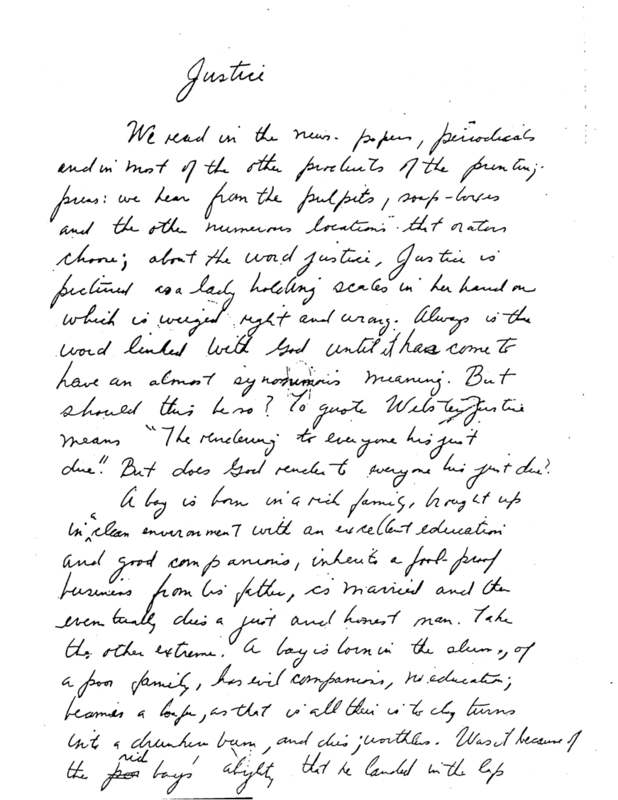 An essay titled “Justice” that he wrote at age 14 struck me as fairly observant for a young teenager, as it considered the ancient themes of nature and nurture. I meant to write it down, but was unprepared and didn’t have a pen or paper with me. On a subsequent visit, I was disappointed to find that the exhibit had changed and the essay had been removed. After exchanging a few emails, one of the librarians there kindly dug up the essay and forwarded me a scanned version of it (below). Now, one could argue that the terms he used, such as the notion that people being born in squalor may have “evil companions” and turn into “loafers” or “drunken bums,” are insensitive or elitist (surely, evil and alcoholism do not recognize class boundaries). But I think that’s the wrong lesson to draw here. He was writing about two hypothetical extreme individuals, not stereotyping whole groups. For a teenager from a very well-to-do background, I think he demonstrated a great deal of introspection regarding his own position in life and how he got there, recognizing that people vary in where their starting gate is. To paraphrase Jim Hightower’s baseball analogy, if you are born on third base, you shouldn’t delude yourself into thinking you hit a triple. It should be uncontroversial to say that chance plays a role in people’s general lot in life, and that this is largely contingent upon our parents and the time and place we happen to be born. (I don’t know about you, but I did not choose to be born to Irish-American parents in New England in the 1970s. Heck, I didn’t even choose to be a human, or even to be born at all). As a species with culture, we have a dual-system of inheritance, as we get more from our parents than their genes. More often than not, we also get their language, their religion, their political leanings, perhaps a few quirks and habits, but also their general socioeconomic position. These things may not be equivalent to fate, and we can escape them. But where we start will have an inescapable bias on our trajectories in life. For a future president to recognize those things – as a teenager, no less – seems satisfying to me. We could use more philosophical introspection and empathy in our elected officials. This entry was posted in Human Variation, Nature and nurture. Bookmark the permalink.